There's not many things that we take seriously, but beer is definitely one of them. We're very lucky to be part of the Laine Brew Co family, and therefore we always have their fantastic beers available. Look out for specials such as the Twisted Lips Sour, Neon Angel IPA and the incredible Salted Caramel Porter. 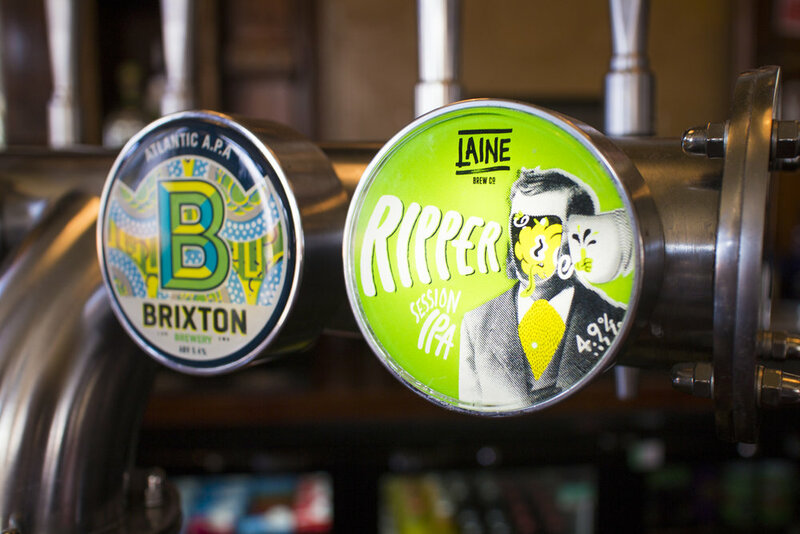 We also have a lines dedicated to those very clever folks at Brixton Brewery and Gipsy Hill; they create amazing beers and we feel it's only right to share them with you. We also have some special special guest lines reserved for the beers that make us do a happy dance. We like to keep it local, so look out for amazing breweries like London Beer Factory, Brick, Brockley, Pressure Drop, Camden and Canopy. We believe in keeping it fresh, so we continuously rotate our beers so that there's a great new surprise for you every time you visit. We do, however, make sure that we keep a couple of the favourites on permanently. For the more obscure tastes such as India Stouts, Saisons and Sours we have a great selection of cans and bottles so that we cater for everyone... even beer lovers who are Gluten Free!